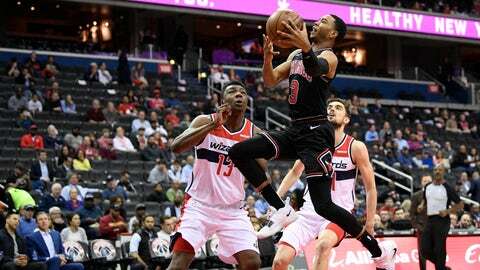 Bulls: G Kris Dunn (back) was out for the fifth straight game. Coach Jim Boylen hopes Dunn can stay healthy for the 2019-20 season. “Next year starts today,” Boylen has told Dunn and the other players. “It doesn’t start next year.” … F Otto Porter has been out for eight straight games with a strained right rotator cuff. It was the first time Porter, who was traded from Washington, had returned since the Feb. 6 trade. A video tribute was played in the first quarter.